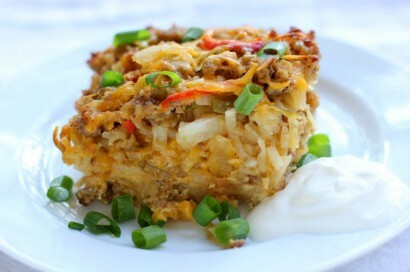 Sassy Sausage & Hash Brown Breakfast Bake, Yum! – Go Blondie! Sassy Sausage & Hash Brown Breakfast Bake, Yum! Over the weekend, we had visited my sister and husband to celebrate my nephew’s 11th birthday! My parents were present and two close family friends! My nephew requested pizza for the main dish. My sister decided to make homemade pizzas which were so delicious. Besides my bringing wine, I wanted to contribute in making something for breakfast because we had spent the night. I was on Tasty Kitchen looking for a good breakfast bake. I am not a fan of a lot of eggs but I love hashbrowns and sausage. Well, I found a great recipe. I did a little vamping with it but tasted great! My mom and sister thought it was a little spicy. So play around with the ingredients to make it to your tasting. You can definitely make it more spicy and it can be tamed down as well. This breakfast casserole is perfect: the slight heat of the peppers, sausage, and cayenne pepper are the perfect complement to the layers of crisp hash browns and cheese. It’ll fill you with warmth and satisfaction on a cold autumn morning. Since it can be prepared days in advance and popped into the oven when you wake up, it’s perfect for brunches or family breakfasts where you’d rather not be trapped in the kitchen! For the prep, I mixed all mine up the night before, except the liquids. I had just layered everything and it was ready to go. Grease an 8-inch square baking pan and preheat the oven to 350ºF (if you’re baking the casserole on the same day). In a large skillet over medium-high heat, crumble and cook the sausage until completely browned and cooked through. Remove the sausage to a paper-towel-lined plate to drain. Discard all but a couple of teaspoons of its grease. Place peppers, jalapenos, and onions into the skillet and toss to coat them with the grease. Sauté them for a few minutes until they’re soft and the onions are beginning to turn translucent. Add the garlic and cook for about 30 seconds, stirring constantly, until it’s fragrant. Remove this mixture to the paper-towel-lined plate with the sausage. Add the olive oil to the skillet. Brown the hash browns in batches by spreading out about a third of them over the bottom of the skillet in a flat layer. Cover the skillet and let them cook without stirring for around 10 minutes (double-check the directions on your hash browns package). When one side is browned, flip the hash browns and brown the other side. Remove these to a separate paper-towel-lined place. Continue until all hash browns are browned. I did not brown the hashbrowns in a skillet. I had just layered them in the pan right out of the bag and it worked great and saved a lot of busy work. Place half of the hash browns into the baking pan in an even layer. Top with half of the sausage, peppers, and onions mixture and 1/2 cup of cheese. Repeat these layers once more. In a small bowl, whisk together the egg, evaporated milk, cayenne pepper, paprika, salt and pepper. Pour this mixture evenly over the hash brown casserole and cover it with aluminum foil. You can refrigerate the casserole overnight at this point or bake immediately. If you refrigerate it, let it sit out at room temperature while the oven preheats. Bake the casserole for around 50 minutes before removing the foil and baking an additional 10-15 minutes. Let the casserole cool for 10 minutes before serving it with sour cream, diced jalapenos, hot sauce, salsa, green onions, and some fresh cilantro or parsley. Goblins, Ghouls and Candy… Happy Halloween! Your breakfast was delicious and the heat for most people isn’t too much. I just don’t care for any heat…FYI you are making 2 pans for breakfast after Thanksgiving!!! lol I will have fruit to go with it. We will definitely make that for Thanksgiving! It was really good the next morning for leftovers. Very filling!